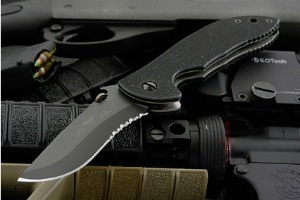 Description: The Emerson Commander is the winner of the "Best Overall Knife of the Year" at the International Blade Show in Atlanta, GA. Blade Show is the world's largest cutlery showcase and is the cutlery industry's premier event. This award is judged by fellow manufacturers and is the highest honor and most sought after award in the cutlery industry. 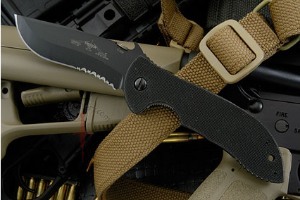 The Emerson Commander is a 21st century combination of design, materials, performance, and razor sharpness. This knife, along with other Emerson Knives, sets the new standard for the cutlery industry and continues to push the design and performance envelope for cutting tools well into the 21st century. 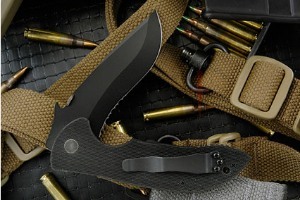 The Commander - knife-battle tested and proven - incorporates some of the most advanced ergonomics ever featured on a folding knife. 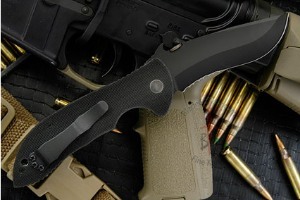 The knife, already in use with elite armed forces, European Military strike teams and NATO Counter-Terrorist units throughout the world, was chosen by the U.S. Navy SEAL teams for issue to special units within the Naval Special Forces Units. 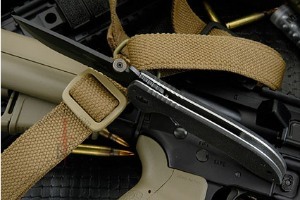 Because of its ruggedness, it has become a favorite of hunters, outdoorsmen and adventurers the world over. 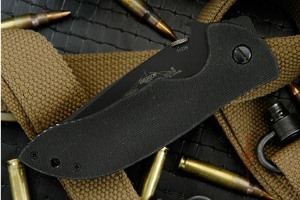 The Commander features Emerson's patented Wave opening feature. In an emergency or injury situation the knife can be opened with one hand as it is drawn from the pocket. The blade is sharpened with a conventional V grind. 0.26611328125 0.125 266.11328125 125 Trailer Completed.